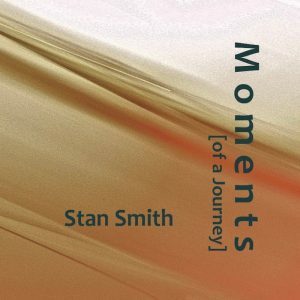 Legendary Columbus guitarist, composer and educator Stan Smith recently created a Bandcamp page where he has three new albums for sale. Two are collections of Soundrones duos with Lisa Bella Donna on synthesizer that are worth exploration. But the other is Moments (of a Journey), an aptly titled 13-track release that showcases his compositions (with help from David Ornette Cherry and Bella Donna) brought to life by a host of extremely talented musicians. Beyond Bella Donna and Cherry, the list of collaborators includes Steve Perakis, Jeff Ciampa, Danny Aguiar, Ryan Jewell, Breeze Smith, Nicole Sherburne, Rob Parton, Byron Rooker, Ralph Miles Jones III, Ryan Hamilton, KT Ramsey and Miss Sara D. Smith is celebrating the occasion with a CD Release Party at Brothers Drake on Saturday, September 1st at 9pm where he will be joined onstage by Bella Donna, Perakis, Bryan Olsheski, Shane Willis and more. There is no cover, and CDs will be available for sale. Keep reading for my thoughts on this exquisitely adventurous release. After the atmospheric and contemplative “Open Windows” and “H2” get Moments (of a Journey) underway with Smith and Bella Donna establishing a deep and intricate sonic universe, “Maracatu” finds a worldly quintet charging into Afro-Brazilian rhythms with lively soprano and tenor sax colors from Sherburne. After the relatively brief opening trio of tunes, the epic feel of the 9-minute “Y” is well-earned. Ciampa and Aguiar lay down a thick groove, Bella Donna’s keys and effects add swirling winds and depth, and Smith introduces a breezy, infectious melody, all of which sets the stage for soulful vocals from Miss Sara D and KT Ramsey, and the melodic voices and instruments alternate, mix, build and fall away for a spiritual voyage narrated by the searching lyrics. “Crystal Caverns” and “Dystopian Soundscape” feature a trio of Smith, Bella Donna and Cherry on pieces by Cherry – spacey explorations that further develop the adventurous nature of the album. Smith takes the lead on the laid-back throwback “23,” with his nylon string guitar contributing ample warmth before Parton’s flugelhorn further deepens the melody and adds cozy accents in a relaxed concluding jam. This warm and timeless feel continues on “‘Leen,” where Smith’s engaging melody is amplified by Bella Donna’s soundscapes, and excellent solo work is contributed by Parton, Rooker (alto flute) and Bella Donna. The journey takes another turn on “Walls Wide Listening,” with Jones III’s bass clarinet in front of a subterranean voyage, assisted by an otherworldly chorus of voices and atmospherics. “X” has a lush orchestral introduction courtesy of Parton, Rooker (soprano sax) and Hamilton (trombone) that slowly builds, incorporating Smith’s electric guitar, Jewell’s well-placed percussion, and Perakis’ bass. Cherry’s trio with Smith and Bella Donna returns for “Underwater Temple,” which indeed conjures the mystery of the sea’s depths. “1966” entails a septet for a final fusion ensemble excursion, with lighter moments from Sherburne and Smith juxtaposed against hot rock bursts and steaming grooves, all powered by the ace percussion team of Aguiar and Breeze Smith. “Vocal Clusters,” a final Cherry trio composition, appropriately concludes the album with a searching, wondering improvisation from Stan Smith, Bella Donna and Cherry.